Tag line: "Men fighting to remain boys"
In the hilarious 1977 comedy, Slap Shot, Paul Newman plays Reggie Dunlop, player-coach of the amateur hockey team, the Charlestown Chiefs. Over the course of the movie, the Chiefs go from perennial losers to the most successful, not to mention most hated, team in the league. And what brought about this dramatic turnaround? It was the addition of three brothers, Jeff (Jeff Carlson), Steve (Steve Carlson) and Jack Hanson (David Hanson), to the roster, a trio of goons ready to drop their gloves at the slightest provocation and beat the hell out of the opposing players. The Hansons were an intimidating force on the ice, and thanks to their no-holds-barred mentality, the Charlestown Chiefs went from zeroes to champions. The Chiefs, a 2004 documentary, gives us yet another team named The Chiefs, which also has its share of fighters. Only in the case of this movie, the violence is 100% real. 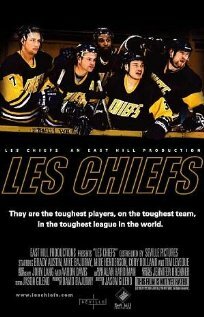 Directed by Jason Gileno, The Chiefs follows the Lavel Chiefs, considered by many the toughest team in the QSPHL (Quebec Semi-Pro Hockey League). Several of the players, including Mike Bajurny, Brady Austin and Cory Holland, never leave the arena; they reside in a dormitory that management built under the bleachers, a place affectionately referred to as “The Rat’s Nest”. Along with teammates Mike Henderson and Tim Leveque, these three are ready to do whatever it takes to help the Chiefs win, even if it means spending most of the game in the penalty box. At one point in The Chiefs, Mike Bajurny (whose brother, David, produced the film) compares playing in the QSPHL to “trench warfare”, and from the looks of it, his observation is spot-on. Throughout the documentary, we see plenty of swinging sticks, flying fists, and the odd player jumping into the stands to take his frustrations out on a spectator. One particularly funny scene involves a bench-clearing brawl, shown in slow-motion and set to ballet music, as if the combatants were dancers on a stage. Naturally, being a hockey goon has its ups and downs; Bajurny tells of how he once took a high stick to the face that resulted in 40 stitches. On the flip-side, it also wins you the admiration of hundreds of fans. As the movie opens, we meet Chiefs devotee Pierre Landry, hard at work making a championship belt with the team’s insignia on it. Of course, not everybody likes a good fight. Mike’s mother, Nancy, can’t understand why people enjoy watching players beat each other to a pulp. “They say it’s all part of the game”, she says, “but I’ve seen the Olympics, and I think that’s good hockey, and they don’t have to do that”. Sure, die-hards love the fights, but for the family members, they aren't much fun. With the QSPHL being a semi pro league, the game footage shown in The Chiefs isn’t of the highest quality (many times, it looks like only a single camera was recording the event, and from quite a distance away). The film also devotes a great deal of time to chatting with the players, and occasionally is a bit too talky for its own good. Yet by getting to know these guys so intimately, director Gileno also brings emotional weight to their story, and in so doing, transforms The Chiefs into something more than goons slugging it out in the middle of an ice rink.